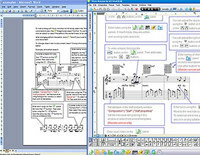 Music making in ms word makes it easy to enhance microsoft word documents with music notation. The unique product has no competition, and combines advanced features of the popularl music notation software, magicscore 6, with world`s most popular text processor, allowing to produce music literature, articles, brochures or tutorials complete with music notation. Using music making in ms word is simple, and the learning curve is easier than any music notation software. Combine music notation with professional text formatting, complex graphics, mathematical equations and tables easily in microsoft word to produce stunning publications, educational matters and tutorials, popular and scientific articles with attractive design and text formatting. Publish sheet music in the internet or print sheet music to produce handouts or brochures. Music making in ms word allows using all features of microsoft word such as printing, web publishing and embedding of objects in a variety of formats to write music, create and publish your work. Insert single notes, diagrams or add groups of chord descriptions by simply clicking buttons, or create your own musical symbols with ease. You can send your word documents complete with music notation to anyone And they won`t need to install music making to see the music notation. No need to save your document as a pdf file or export it as an image to let your recipients see or print sheet music. Music making in ms word makes it easy to transpose music and write lyrics in a familiar way. Use your mouse, computer or midi keyboard, virtual piano keyboard to write music in a microsoft word document, and get access to all the features of a music making software without leaving ms word. If you need a useful music notation program, music making in ms word is powerful, easy and quick to learn. Music Making in MS Word is an audio utility that works under windows xp, windows vista, . Estimated download time for Music Making in MS Word on a common adsl connection is less than a minute. Version 1.555c was released three thousand three hundred two days ago by MagicScore Music Software. Click the green download button to download it now.